Benedictine Novice Dane DeDecker professed temporary vows as a Benedictine monk on Aug. 6 in a liturgy at the Archabbey Church of Our Lady of Einsiedeln at Saint Meinrad Archabbey in St. Meinrad. His profession of temporary vows came at the end of his novitiate, a year of prayer and study of the Benedictine way of life. As is the custom during the profession of vows, he was assigned a religious name. Novice Dane will now be known as Brother André. Brother André, 37, is from Geneseo, Ill. He attended Geneseo High School and studied for a year at St. Mary’s University in Winona, Minn. 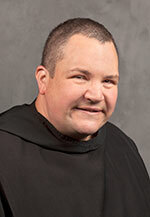 He was previously a member of St. Anthony Parish in Atkinson, Ill. Prior to entering the monastery, he had worked for 12 years as an over-the-road truck driver.